Clockworks stand apart from other ancestries presented in Shadow of the Demon Lord in that they are a people created, their bodies assembled in workshops and given the semblance of life by souls stolen from the afterlife and bound to their mechanical forms. The soul tethered to the machinery can only control the body and perceive from it while its inner mechanisms move. Once the cogs stop turning, the components stop moving and the clockwork stops, becoming an object, albeit one of many intricate parts and possibly of great beauty. Ghosts in Machines reveals the secrets of this strange people by pulling them apart to show how they are they made and why, how they fit into the world, and what they can expect as long as their souls remain trapped in their bodies. Finally, this supplement provides you with a variant method for creating clockwork characters, offering new options and expanded details to help realize your character in play. 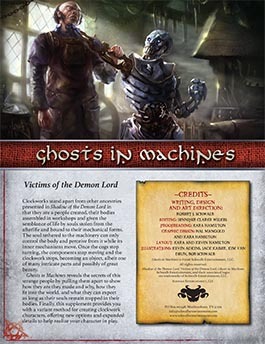 Buy Ghosts in Machines in PDF from Schwalb Entertainment or DriveThruRPG!